Hey y’all! I gave this guest post over on Ask Anna last year and totally forgot to share it over here! These little fabric rosettes are so easy to make and are great for crafts-I’ve used them on wreaths and even made barrettes with them! The supplies are simple: a hot glue gun and fabric scraps. Here I have used the end of a remnant 44″ long cut to about 1-2 inches wide. This is not an exact science, feel free to experiment with different lengths and widths of fabric to change the final dimensions of your rosettes. Okay, lets get to work! 2. 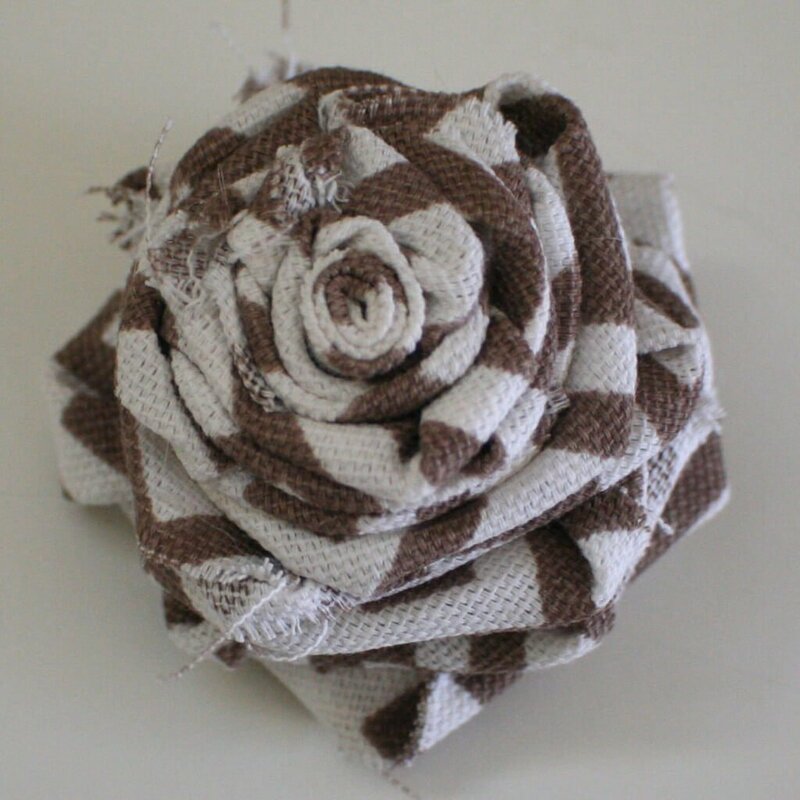 Begin rolling your fabric tightly to form the center of your rosette. 3. After the rosette center is the size you want (I rolled mine about four times around) start forming your petals by folding the fabric down at a 90 degree angle. 4. Twist the tail of fabric as you wrap it until it is again parallel with the floor. Secure with a dot of hot glue. 5. Continue to fold and twist securing every few petals with hot glue as needed. 6. Stop twisting when you have about 1-2″ of fabric left at the end. 7. 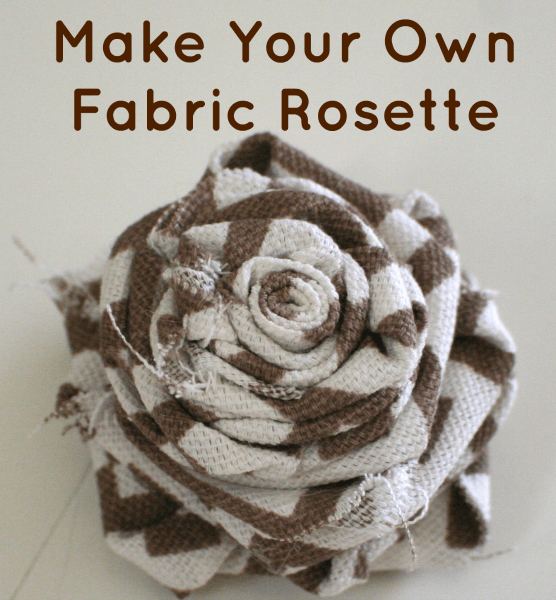 Fold the tail of fabric over and glue secure to the base of your rosette. I like to use a bit of glue here to ensure it does not unravel. Don’t worry about the strings from the fabric edges-it adds to the appeal of these little rosettes. That’s it! You’re all done! Once you get the hang of it these are super easy and fast to make. These look great on necklaces, headbands, and so much more. 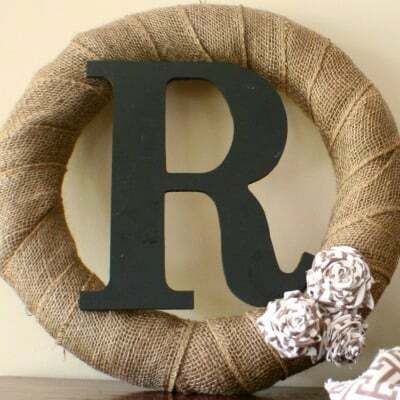 I used these particular rosettes on my burlap monogram wreath. Oh, my petals!!! I’m so glad I found you and your tutorial! Yes, I’m sitting on the floor, computer on lap, fabric in one hand and hot glue gun in the other–and a very upset Shih Tzu because I’m not paying attention to her… It’s quite the scene… Anyway… This has been the best, easiest to follow tutorial I’ve come across, and believe me and Pinterest, it’s been quite the hair-pulling journey! My first rose turned out just wonderfully, and I plan to use it on the wreath I’m decorating. Thank you, thank you, thank you for posting this!! !